Graydon Canter had a fortune and a place on all the hottest “Thirty under Thirty” lists, until a series of personal missteps nearly destroyed his career. A year teaching at a D.C. law school is just the break he needs to get his life back in order, as long as nothing—and no one—trips him up. When Blair and Gray are forced to work together, their explosive attraction becomes impossible to resist. But Gray’s demons have drawn him dangerously close to the edge, and Blair has spent her life playing by the rules. Will she break them for a shot at love? Chanel Cleeton’s Capital Confessions series is the best kind of escapist reading, it has it all drama, intrigue, and passion in spades. Unlike teachergirl73 who took poly-sci in university I was never that interested in politics. In fact, when pressed I am sure that what political views I have are likely contentious. I never did watch The West Wing, the closest I got was a great appreciation of The American President. I love it when TBS airs that. There is something about Michael Douglas, he just looks so presidential. But I digress I finally listened to my besties pleas and binge watched Scandal this spring. All four seasons! It was awesome but I was left with a burning desire for… well more and that is when I thankfully discovered the awesomest of awesome Chanel Cleeton. 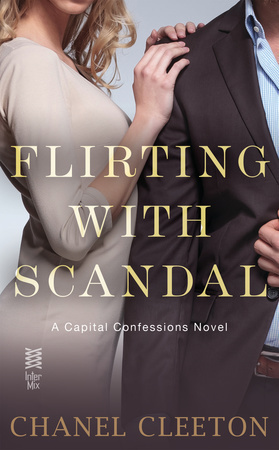 I devoured Flirting With Scandal, it was not as I stated in my review just another Scandal ripoff but a whole new entity that appealed greatly to my nighttime drama lovin’ heart. If you haven’t read it yet, take my advice get it now. Blair was the perfect legitimate sister introduced in FWS who unlike the majority of the inhabitants of Washington was a) nice and b) didn’t go off the deep end and blame her sister Jackie for the tawdry nature of her birth and upbringing as the daughter of a notorious political mistress. This rare creature intrigued me and I was anxious to read her story – get my fix – as soon as I completed Flirting. Playing With Trouble was if possible even better than Flirting With Scandal. Blair and her bad boy, now reformed, professor were so enjoyable to read about. Truly is there anyone who doesn’t love the hot professor trope? In Playing With Trouble, we find out that the Capital Confessions blog is stronger than ever and sadly still fixated on the Reynolds family. Blair, much to her senator father’s chagrin opted not to marry her fiancé whom she caught in flagrante delicto with the best man on her wedding day, is trying to rebuild her life with limited success. Her grades allowed her into an average law school where she is struggling with not just the concepts but with her ridiculously demanding professor who seems to delight in putting her on the spot each and every class. Graydon is also seeking redemption, he flew too close to the sun back home in Chicago and one trip to rehab later he is clean and sober looking to make a fresh start. His marriage and skyrocketing legal career were casualties of the rock and roll life style he was living. The last thing that he wants or needs is the complication of the attraction he has to his student. A relationship with her would not only trash his fledgling teaching career but destroy the beginnings of his new beginning in Washington. However, he cannot ignore the draw of getting to know Blair better when the opportunity presents itself thinking that he can withstand the temptation. Suffice it to say I loved Playing With Trouble, without a doubt the Capital Confessions Series is one of my favourite discoveries of 2015. I can hardly wait for the next installment Falling for Danger, which tells us Kate’s story and even better she’s working for the CIA! School, Capital Confessions, and Wild Aces series. Previous PostHEROES ARE MY WEAKNESS – Susan Elizabeth Phillips EXCERPT/NOW AVAILABLE!Next PostLUCKY’S CHOICE (The Last Riders #7) – Jamie Begley NOW AVAILABLE!